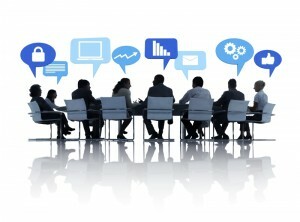 Who owns real-time customer interactions in the C-suite? Who owns real-time customer interactions in the C-suite? was published on Customer Intelligence Blog. Marketers today use varying adaptations of the customer journey to describe a circular, looped decision pathway with four distinct phases. Mapping the right data to specific stages of the customer journey is all about getting to know your customers and developing initiatives to put that knowledge into action. Applying analytical models across the key customer journey phases uncovers opportunities to cultivate value generating behaviors and extend the customer’s lifetime value. Initial Consideration Set (Research/Discover). Data and analytics in this phase help you gain deeper customer understanding of customers and prospects. Segmentation surfaces stated and unmet customer needs and buying motivations. Reach the right prospects with look-alike acquisition models and evaluate prospects with lead scoring techniques. Active Evaluation (Explore/Consider). Data and analytics in this phase help you dynamically adapt marketing efforts to customer response – in real-time. Offer optimization techniques can match the appropriate offer based on historical customer response. Amazon’s recommendation engine is a familiar example. Also, A/B and multivariate testing can assess various marketing variables, such as messaging and content types before you roll out initiatives on a wider scale. Moment of Purchase (Buy/Convert). Data and analytics help you understand how and when customers will purchase. Predictive techniques such as propensity models help marketers predict the likelihood that a customer will respond to a specific offer or message and convert. Expand share of wallet with cross-sell and affinity models; or, understand future buying behavior through propensity models. Post-purchase experience (Use/Maintain/Advocate). Data and analytics in this phase help you uncover patterns of usage behavior and further drive customer engagement. For example, a retail site may tell you the status of your recent order the moment you land on the home page. Churn models such as uplift modeling and survival analysis can provide early warning signs of defection. Preempt customer churn with corrective actions, such as special offers or free upgrades. Brands that build the most effective customer journeys master three interrelated capabilities: unified customer data platforms, proactive analytics and contextual interactions. Unified customer data platforms: This capability unifies a company's customer data from online and offline channels to extract customer insights and steer customer experience. This includes the ability to cleanse, normalize and aggregate data from disparate systems – within the enterprise and externally – at an individual level. Proactive analytics: Purpose-built data collection and analytics capabilities that incorporates both customer analytics (give brands the customer insight necessary to provide offers that are anticipated, relevant and timely) and marketing analytics (evaluate marketing performance using metrics, such as ROI, channel attribution, and overall marketing effectiveness). Contextual interactions: This capability involves using real-time insights about where a customer is in a journey digitally (browsing product reviews) or physically (entering a retail outlet) or to draw her forward into subsequent actions the company wants her to pursue. The results are dramatic when marketers can combine data management, analytics and insights execution into unified marketing platform. Consider gourmet gift retailing icon, Harry & David. By combining data-driven marketing with enriched customer insight, the company transformed its catalog heritage into a contemporary, digital retailing powerhouse. In the past three years, customer retention has increased by 14 percent and sales per customer have gone up 7 percent. The largest retail group in Switzerland, Migros, used data and analytics to further optimize the customer journey. Digitally-empowered prospects and customers are calling the shots, going after what they want when they want it. With a unified view of data and analytics, brands can position themselves in front of their customers’ paths as they navigate the customer journey. For the brands that can see the world as their customers do – and shape the customer journey accordingly--the reward is higher brand preference, revenue and cost improvements, and a lasting competitive advantage. A better approach: Align data and analytics across the customer journey was published on Customer Intelligence Blog. Generating rich customer insights – the centerpiece of successful marketing efforts – is more arduous and crucial in today’s digitally saturated world. Brands must not only understand their customers across all touch points, but analyze and glean patterns from their behavior, and quickly respond to the faintest signs of changing preferences and needs. Our multi-screen world creates even more complexity for the marketer. A recent Nielsen study revealed that the typical US consumer now owns four digital devices, and spends 60 hours a week consuming content across devices. Plus, a majority of US households now own web-connected televisions, computers and smartphones. Amidst all these digital devices, consumers also have numerous choices for how and when they access and engage with that content as part of their customer journey. Given the growing number of digital touch points where customers now interact with companies, marketing often can’t do what’s needed all on its own. Many brands typically think of customers (and the insights gleaned from them) as being “owned” by particular function – marketing owns brand management; service owns support; sales owns customer relationships; retail operations own the in-store experience, etc. As a result, the customer data and corresponding insights are fragmented across these functions. When businesses can’t effectively combine customer insights across multiple digital channels, let alone across multiple customer-facing functions, marketers are less confident about their efforts. This is why brands must have effective technologies and processes in place so they do not lose track when charting, designing and measuring the customer journey. Whether customers are browsing your brand website, completing a purchase on your mobile app or talking with a service representative via online chat, customers demand to be recognized and treated consistently no matter the channel. To this end, SAS 360 Discover goes beyond channel-level data to collect detailed customer-level data for deeper customer understanding and better marketing decisions. SAS 360 Discover is part of the new SAS Customer Intelligence 360 suite that can help you create a new level of customer experience. Now, you can go beyond page views and clicks to knowing why customers behave as they do on your digital properties, what are the characteristics of your most profitable customers and which digital interactions successfully resulted in loyal, profitable relationships? In today’s marketing environment, brands gain a competitive edge if they stop perceiving customer engagement as a series of discrete interactions and instead see it as customers do: a set of interrelated interactions that, when combined, make up the customer experience. SAS 360 Discover: Elevating the role of customer insights for confident digital marketing was published on Customer Intelligence. Consider the last email or digital ad you received from a favorite retailer. It may have included an offer to save 20 percent on your next online purchase, or an invitation to shop in store during an exclusive sale. You don't think too much about this brand’s customer relationship management (CRM) or marketing capabilities, because you don’t have to. Why? Because the most sophisticated brands employ tools that can tailor an email or a social media post to their buyer’s sweet spot. Powered by data and analytics, these CRM tools do the heavy lifting for marketers to engage their customers in more personalized, authentic ways. 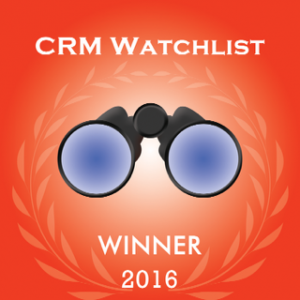 Often recognized as a forerunner in CRM software, SAS Customer Intelligence has added a new accolade to its trophy case as a winner o n the 2016 CRM Watchlist. The annual list – curated by leading CRM industry analyst, Paul Greenberg – includes the dominant companies to watch in the CRM market. As Greenberg notes in his announcement blog post on ZDNet, the competition was especially stiff this year, with 131 vendors vying for the winners spot. With each submission, Greenberg reads and scores the company (which is weighted), which is then followed up with extensive research analyzing the vendor in the markets it addresses. The SAS customer intelligence team is honored to earn a spot on the winners list for 2016, demonstrating SAS's commitment to helping brands deliver customer experiences that matter. SAS named a winner on the 2016 CRM Watchlist was published on Customer Intelligence. Marketers are walking a tightrope today with data privacy issues: Data can simultaneously bring customers and brands together and further drive them apart. Recent data breaches, potential changes in data-privacy legislation and regulations loom large as customer expectations concerning marketing data continue to rise. As a result, today’s complex data issues are becoming a more like a horror flick. The outcome of these discussions, customer expectations, data-security lapses and rules-making efforts could change everything. Consumers Refuse to Mask Their Data Privacy Concerns. Infographic courtesy of Direct Marketing News. Amidst this backdrop, SAS conducted a global study on how consumers balance their need for privacy and personalization: Finding the Right Balance Between Personalization and Privacy. Some of the findings are appropriately depicted in the chilling infographic to the right, created and originally published by DM News and included here with permission. The complexity and fragmentation of the customer journey due to the explosion of digital channels, platforms, data and content has placed enormous strain on marketing to be contextually and personally relevant and responsive. Data privacy slips can easily obliterate brand choice. Also, when different source systems capture the same customer information, it is seldom consistent. And inconsistency can lead to errors, which often results in angst due to privacy violations, plus unnecessary costs. To minimize the horror, technologies such as Master Data Management can take charge of key information assets – defining a “master hub” of core information that references the same key asset by all users and systems. In this regard, the biggest complaint about data privacy that we hear from marketers is that the maze of privacy laws from various industry bodies and government agencies are often cryptic and sometimes in conflict with each other. The lack of harmonization within and across countries remains a source of dread, confusion and annoyance for most businesses. For example, in the US, 47 states have attempted to legislate privacy in one way or another. Unlike the European Union, there is no overarching law at the EU level that sets a minimum standard for privacy. Every member country has its own laws. As a result, if you do marketing in the EU, you must deal with the privacy laws of 28 member states. Despite concerns over privacy, consumers are still willing to trade privacy for personalization. Our study found 69 percent of those surveyed said recent news—NSA leaks, social media privacy changes, data breaches, etc.—increased their privacy concerns. Yet, consumers are still willing to trade privacy for personalization. Our study showed that 57 percent still expect businesses to know their preferences and understand their needs. In exchange for consumers' trust, brands must offer the following in every interaction: relevance, value and control. Consumers show trust by providing customer information in exchange. Brands can also assure customers that their data is managed well and give customers options to decide how their personal information is used.Consumers are okay with giving up some of their personal information for greater personalization--as long as they get to make that choice themselves. For more helpful insights and take-always, I suggest reading Finding the Right Balance Between Personalization and Privacy in its entirety—preferably in a well-lit room. Data privacy can be a trick or treat was published on Customer Analytics. In our fast changing, increasingly digital world, building a strong customer relationship is the lynchpin to building a great business. Digitally-savvy, hyper-connected customers are now harder to define, understand and please than ever before. Today’s enterprise must focus on the customer experience as never before--or risk being replaced or ignored. A new report by Harvard Business Review Analytics Services, "Lessons from the Leading Edge of Customer Experience Management" spotlights how leaders in customer experience management are developing strategies, capabilities, processes, and metrics to gain competitive advantage and remain relevant. One of the striking aspects--and there are many--of this report pertains to measuring customer experience efforts. 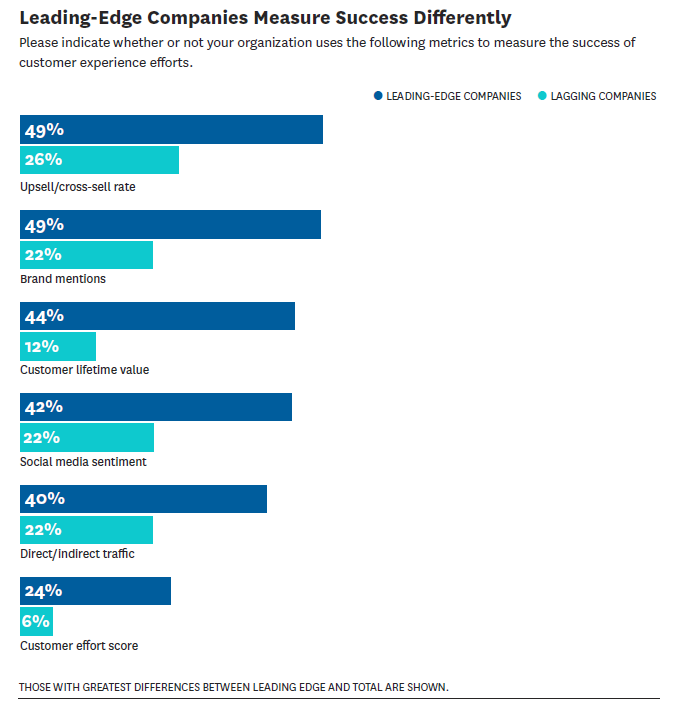 Maximizing the customer experience ROI (52%) was cited as the top issue. Nearly half also reported that it's extremely challenging to tie customer experience investments to business outcomes. Leading-edge firms aren't immune from this issue, with a third in the same predicament. That difference suggests that a higher incidence of tying customer experience to business outcomes sets the leading-edge firms apart. Still, a majority of leading-edge companies admit to having at least some difficulty tying their customer experience investments to business outcomes. The traditional measure of customer experience success—customer satisfaction scores—are widely used in all companies. Yet a variety of other metrics deemed highly important by those that use them, such as customer effort and digital engagement scores aren't as prevalent. 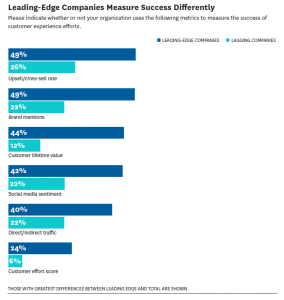 The report showed that customer experience leaders use an array of metrics, often more effectively, to track customer experience management progress, including measures such as customer lifetime value, indirect traffic, social media sentiment, and upsell rates. Customer engagement measures. This category examines the effectiveness of your customer experience efforts--in other words, the health of your customer relationships. Engagement metrics help marketers measure the specific actions-- transactional or non-transactional--that people take when interacting across customer touch points as well as their resulting impressions toward the brand. Are they attracted or disillusioned? Quantitative metrics include online interactions (visits, downloads, registrations, etc.) or at the interactions at physical location or store, number and frequency of visits, recency, customer migration metrics (from lower to higher tiers of customer value), and customer profile completion rates. Softer, qualitative metrics include satisfaction survey responses and sentiment in social mentions or contact center experiences. Operations performance measures. This category assesses the efficiency of customer experience activities. By tracking operational metrics, marketers can get a sense of the size, scale, and activity level of customer experience initiatives, and how those change over time. Marketing operations management can connect budgeted and actual spending with activities, tasks, resources and objectives related to your customer experience efforts. Operational metrics can include enrollment rates in loyalty programs or campaigns, offer response rates, issue resolution times, asset re-use, and the like. Corporate business measures. This category assesses customer experience contribution to overall corporate value. Corporate metrics incorporate available financial and market data to link customer engagement and operational performance and to the firm's top and bottom lines. Examples here include revenue, growth,margins, market and wallet share, and other productivity measure. Tying everything together, these metrics are often the ones that matter most to the executive team. Considering the overarching objectives for their businesses, marketers must choose appropriate measures that map to those goals directly or indirectly. For example, if the corporate imperative is to increase customer retention, then marketers should examine the correlation between online engagement and length of relationship or status level to renewal revenue. Here are reminders as you embark on the customer experience measurement journey. Approach customer experience measurement based on an integrated data set. Data integration is the very foundation of demand generation measurement. In the report, one customer experience director is hiring more analysts, working more closely with finance, integrating more databases, and trying to determine the real business value of a satisfied customer. Connect the dots between branding, demand generation, and customer experience. Many companies have separate departments and marketing budgets. One focused on branding, one on lead generation, another on customer loyalty and so on. Ensuring that the business (not just marketing) takes ownership of the entire customer experience--from a customer's perspective-- is vital to gauging success. One survey respondent says it this way, "It’s quite a challenge. Everyone has always measured themselves by progress against sales goals, and customer experience can seem like another initiative. We had to make it clear that it’s not another initiative. It’s part of what we do. We achieve our sales goals via solid customer experience." Focus first on effectiveness, then on efficiency metrics. Effectiveness is answering the question: “Are we doing the right things?” While efficiency is answering: “Are we doing that thing well?” First measure if your omni-channel efforts are effective in driving the desired interactions, involvement, intimacy and influence for your brand. Then look at efficiency metrics by evaluating costs of customer acquisition methods, buying and placement of media content, digital asset use, etc. The best customer experience measures are not only manifested in delighted customers but also in a cheery financial story. The more companies tie customer experience investments to business outcomes, the more organizations will fully appreciate and see value in customer experience investments. To learn more, download the full report "Lessons from the Leading Edge of Customer Experience Management" and let me know what you think. According to the recent 2013 Marketing Performance Management Survey by Forrester, ITSMA and VisionEdge, marketers still have a long way to go. To be relevant to the business, marketers need to measure and communicate the right metrics. Surprisingly, just 40 percent of marketers today think that measuring marketing’s contribution to the business is very important or critical. And even more startling: only a small percentage of CEOs (9 percent) and CFOs (8 percent) use marketing’s metrics in decision-making. The main reasons cited: marketers fail to report on business outcomes; and they tend to focus on past performance rather than predictive insights. Another recent global study by the Economist Intelligence Unit and SAS uncovered a similar disconnect between CMOs and the rest of the C-suite over the value marketing provides to the company. According to the survey, nonmarketing executives – CEOs, CFOs, CIOs, etc. – prioritize driving revenue over acquiring new customers (30 percent to 19 percent). For CMOs, however, marketing priorities are new products/services creation and customer acquisition; driving revenue ranks third. The C-suite expects marketing to paint a picture of how marketing contributes to the business (share of wallet, market share, category growth and ownership, lifetime value, etc. ), especially with rising investments in digital marketing. With marketing optimization, marketers are better equipped to create clearer linkage between marketing investments and activities with business performance—to select the right metrics, set numerical targets, evaluate customer and business constraints, and show how marketing activity contributes directly to business outcomes. Given all the current objectives and constraints on marketing activities, how can we maximize not just the success of this campaign, but overall contribution to organizational growth and profitability? If we increase marketing operations budget, what would the payback be? If we can quantify the financial impact of constraints, could we make a business case for adding resources? The requirement to juggle multiple constraints and considerations is an inescapable part of the marketing equation. This is exactly where marketing optimization comes in – it gives marketers the power to plan and prioritize all customer interactions in a way that maximizes economic outcomes while balancing the capacity to deliver and the likelihood to respond. Incorporate real-world contact policies, such as cross-business considerations (who gets the lead? what assets can be re-used? ), recency and frequency rules, and blocking policies. Understand the business implications of changing any of the resources, objectives or constraints. Define and compare different scenarios predictively to see which ones deliver the most desired customer and business outcomes. 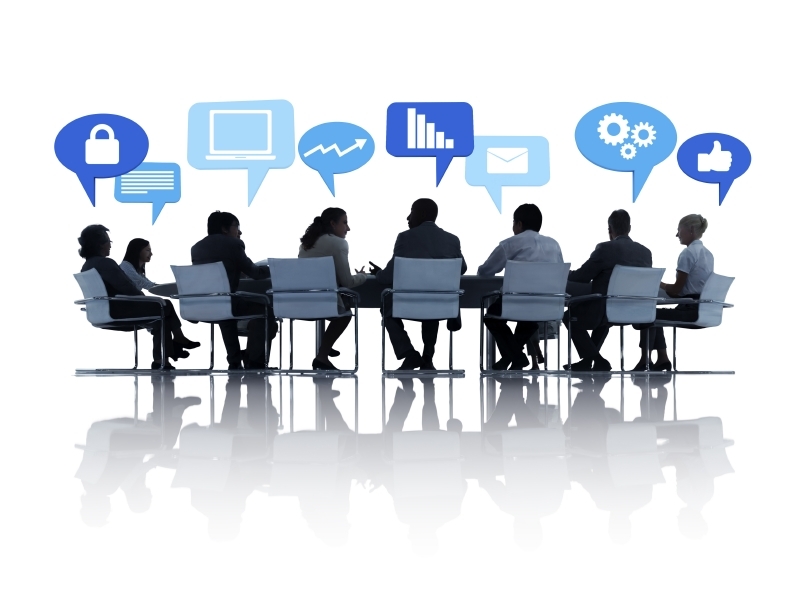 Marketing optimization essentially allows the CMO to link activities in the marketing war room to business value in the board room. For a deeper perspective on how marketing optimization can create positive customer impact, build efficiencies into your digital marketing, and improve business outcomes, check out this paper: Improve ROI with Marketing Optimization. Thanks for following and let me know what you think. In the last decade, CMOs have made great strides in elevating their stature. According to the latest SpencerStuart survey, CMO tenure has steadily climbed from 23 months in 2004 to 45 months in 2012. What are the reasons for this improved longevity? Marketers are becoming more strategic-minded, they're taking a more expansive view of their customer, and they're adding more sophistication and data-driven decisions in marketing campaigns and operations. The swift adoption of mobile devices and the proliferation of digital channels have created opportunities for highly interactive, rich communications between consumers and brands. But those very same circumstances can be a double-edged sword as more consumers demonstrate little tolerance for irrelevant, ill-timed, and “creepy” communications. Marketers may be on a positive trajectory as CMO tenure suggests, but the path is still fraught with uncertainly. CMOs are confronted daily with the challenges and opportunities of maximizing digital marketing, enabling dynamic multichannel interactions, enriching customer experience, utilizing marketing analytics, and—of course—harnessing Big Data. Marketers must be able to unleash the power of analytics throughout the marketing department and in all marketing processes (activities related to strategy and planning, campaign and interaction management, and customer experience management). Analytics, when highly accessible in a marketing system, allow marketers to create value for their customers, while giving businesses an instant edge for improving marketing performance and reducing costs. For instance, marketing automation uses sophisticated analytics to automatically improve relevancy and responsiveness to individual prospects regardless of media or channel. Real-time analytics allow marketers to discover and react in real time to how consumers are interacting with your brand. The upshot: greater agility; better targeting; personalized offers; coordinated campaigns; connected experiences. The analytics must provide ever clearer “line of sight” to revenue growth and profitability, especially as digital spend in marketing budgets continue to rise. CMOs must also insist that their enterprise-marketing platform enable a single point of marketing collaboration: one that aligns objectives, planning, and execution across various marketing roles in the organization for greater accountability. A recent Econsultancy report indicated that 71 percent of businesses plan to increase digital marketing budgets. The average expected increase (of those increasing digital spend) is a significant 28 percent. The result: a higher degree of scrutiny by the C-suite for digital. Analytically powered marketing platforms provide more transparency to marketing personnel and helps the entire organization align resources to objectives, streamline production processes, track budgets and expenses, and improve overall collaboration. The upshot: better collaboration; greater control of marketing spend; stronger marketing investment decisions - especially in digital; more CMO credibility among C-suite peers. In the final view, marketers need demonstrable business results in their quest to maximize digital marketing impact and deliver sustainable growth. Are you evaluating your marketing technologies through the twin lenses of analytics accessibility and marketing accountability? To learn more, please start by visiting the Digital Marketing Resource Center and discover why digital marketing requires the agility and collaboration enabled by analytics. Please share your thoughts, and as always, thank you for visiting! New research by the CMO Council and SAS, entitled "Big Data's Biggest Role: Aligning the CMO & CIO," shows more overlaps than differences between marketing and IT. Big data is uniting the CMO and CIO in their common quest for a customer-centric organization. 61 percent of marketers and 60 percent of IT executives agree that Big Data brings both obstacles and opportunities to the table. Obstacles for marketing include winnowing through big data to arrive at the "right data" and applying analytics for data-driven decision-making. Challenges for the IT department includes the big data realities of customer information, the acceleration of technology change and the explosion of options and platforms. In fact, 52 percent of marketers and 45 percent of IT executives believe functional silos prevent the enterprisewide aggregation of big data--thus hindering customer centricity. Both the CIO and the CMO are accountable for driving profitable revenue growth. While the CMO is often accountable in direct terms, measuring success in terms of market share, customer growth, or loyalty, the CIO needs to show how technology investment contributes to business growth. By harnessing big data (customer, operational, financial) to focus on this common objective, CIOs can move the IT agenda toward contributing directly to customer value rather than solely driving indirect contribution through cost reduction. Marketing focuses on customer needs, customer value, and customer experience. Even with an internal orientation, IT is also increasingly customer-focused. CIOs are recognizing the importance of the external customer as the primary driver of technology strategy. With big data, IT's internal-customer orientation — a focus on delivering value to the internal IT customer — can be shifted and recalibrated for customer-centricity, with the customer at the locus of IT planning, deployment, and support. Enable a single customer viewpoint. IT has had considerable experience in delivering the enterprise perspective on data, information, and technology architecture. Almost all functional areas—customer service, sales, human resources, and many others — have benefited from IT’s approach to enterprise-wide applications availability. Marketing is now joining the ranks to recognize that customer insights culled from just individual campaigns or channels is ineffectual. The vast amount of data at the individual customer level combined with other data sources can create a truly singular view of the customer--regardless of touchpoints. By developing a data management hub focused on customer data and big data flows, IT can impart enormous value to marketing and the organization at large. Of all the C-suite executives, the CMO and CIO are most primed to drive customer-centricity throughout the organization. With big data as the unifying force, the CMO and CIO can and must become comrades in gathering and analyzing data across the enterprise, and adopting technologies that anticipate, automate and accelerate customer engagements. For more interesting details on this global research with over 400 marketing and IT executives, please download the report.